The three Cooperative Banking Associations in Poland are comprised of more than 580 small, local banks that are spread nationwide. Most of these banks supply banking products and services to rural and small-town communities. With more than 150 years of market experience, the Cooperatives are a vital part of local economies. The significant feature of most Cooperative Banks (Co- Ops) is a low number of outlets and a limited geographical target territory. A few Co-Ops consist of more than 15 outlets, but the vast majority include fewer than 10. Although the Co-Ops act independently in terms of their market activities, each of them is associated with three Cooperative Banking Associations: Spółdzielcza Grupa Bankowa (SGB), Bank Polskiej Spółdzielczości (BPS) and Mazowiecki Bank Regionalny (MR Bank). In the past, marketing communications were not a high priority for the Co-Ops. Added to the competitive attitude among the banks, plus a non-consolidated management approach through the Cooperative Banking Associations, the result has been a very limited marketing communications strategy. Occasionally, above-the-line marketing activities were executed through the Cooperative Banking Associations, consisting of TV and radio commercials, and advertising. This, however, has neither communicated a unified message nor has it been part of a long-term marketing strategy. As a result, there is a limited common basis in terms of corporate visual identity and market approach among the banks represented in the same association. Furthermore, the lack of professional marketing resources within the individual banks has kept them away from promoting their own services. Word-of-mouth marketing, historic client relations and a high recognition factor among the local communities has ensured their strong market position for a long time. Nowadays, the Co-Ops’ well-being is threatened by larger commercial banks that were previously operating only within bigger cities. Being small and traditional banking organizations, the Co-Ops have had difficulty sustaining their clientele and securing new customer engagements versus larger bank organizations. Frequently, they are not able to communicate their high standard of service or their market offers, which prevents them from competing with commercial banks in winning new customers, especially among the younger population. This lack of an effective communication channel and shortage of marketing activities puts their future market share at risk. Facing the above situation, the Co-Ops have the strong desire to demonstrate efficiency, modernity and technical competence to reclaim their clients’ trust and win new customers. 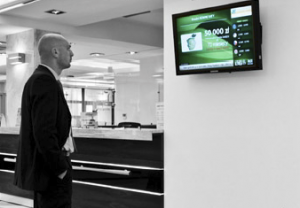 The concept of BSTV, a dedicated digital signage system for the Polish Cooperative Banks, was derived from previous experiences of its operator, DDS Poland. In recent years, DDS Poland has executed and delivered digital signage projects for two network banks: Alior Bank and Bank Zachodni WBK. 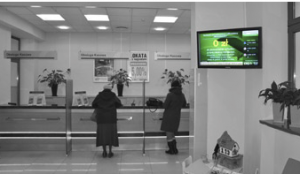 During the implementation of these digital signage systems, DDS Poland learned many valuable lessons and gained a clear perspective of the practical use of digital signage for customer service management in the banking and finance industry. BSTV became fully operational in June 2009. 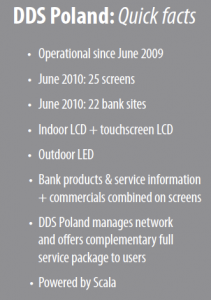 As BSTV operator, DDS Poland provides and manages the platform on behalf of its users. The system is created using Scala solutions, which work seamlessly with the chosen software players to provide content scheduling and distribution. Scala provides DDS Poland with the capability to create sophisticated, branded, dynamic content that combines text, graphics, video and real-time information on behalf of individual co-ops. BSTV is managed remotely by DDS Poland, which provides a full-service concept to create content, manage playlists and schedules, manage the physical operation of the technical infrastructure, deal with maintenance issues and ensure a high level of compliance in terms of functionality. 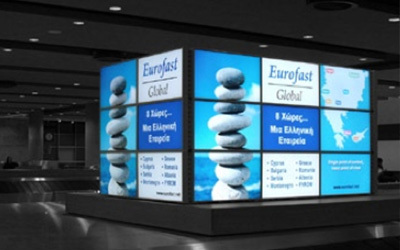 The full options system consists of four BSTV display modules per bank that can be integrated into one display function or work as an independent solution. 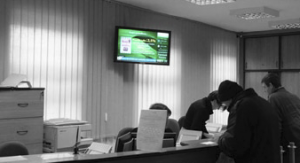 The main module is a Samsung 400MX-2 LCD screen installed inside the bank to communicate with visiting clients. In many situations the size of the outlet requires more than one BSTV display, in which case the screen is multiplied. In most cases, these screens are placed at service counters and function as a queue management system, as well as a product and service information channel for customers who are waiting to see a consultant. The second integrated BSTV module is an interactive LCD touch panel, primarily used to encourage clients to search for customized information on an individual basis. Another BSTV module is an LCD screen installed behind the outside window display of the bank. Its main purpose is to communicate with people passing by outside the bank premises. Finally, BSTV users can enforce their marketing communications even more via a large-format, outdoor LED screen that allows them to distribute their messages with high visual impact to potential customers outside of the outlets. During the development process of this platform, DDS Poland created the possibility for BSTV users to modify the digital content easily through intuitive menus and a dedicated user website. The operational management is extremely user-friendly making it very easy to change content. All authorized bank employees can send content updates and input via the Internet to the operator, who promptly implements the changes. Moreover, DDS Poland provides a complete service package to the cooperative banks by creating digital content and special product and service presentations. DDS Poland also ensures that the quality of the output for a single Co-Op is at least of the same level as larger, commercial network banks. Additionally, DDS Poland supports BSTV users on such matters as color usage and font size, quality and layout of photos, and how to use all potential possibilities of digital signage for each bank’s marketing communications efforts. Thanks to BSTV, Co-Ops are now able to produce and modify a commercial instantly. This enables them to carry out high-end digital marketing activities and achieve client communications benefits that previously were only available to larger commercial banks. By providing a full-service support package, DDS Poland has eliminated the need for the banks to hire additional advertising professionals or extend their marketing departments. Besides advertisements, BSTV provides appropriate infotainment such as weather forecasts, and local and international news. BSTV also displays up-to-date foreign currency exchange rates and content from selected RSS feeds. The infotainment output clearly increases the receptiveness of the displays and its ads. Plus, it encourages bank visitors to use the displays as a source of information. Provides the possibility for tailor-made (single outlet) solutions that, in the future, may become a vital tool for broad marketing activities executed by entire Cooperative Banks Associations. The BSTV project has been fully operational since June 2009. So far, the platform supports sales and customer service operations in 22 outlets of several Co-Ops. DDS Poland Sp. z o.o. specializes in the implementation of digital signage systems using a highly qualified team of Scala engineers who deliver best-in-class service to a range of clients on some of the most advanced projects of their kind. They offer a complete turnkey solution from design and implementation to management and servicing. In order to further enhance their proposition, DDS has recently enhanced its design studio to increase its capacity and capability to produce custom content for digital signage networks. This full-service offering provides their clients with an optimal model for working in partnership and to realize mutual success. For more information, visit www.ddspoland.com.